Todd during the Sunburst at age 47, finishing 27th overall and 1st in age group. Today’s post is very special. My friend, Todd Hoffer, shares his intimate, personal story about his addiction to alcohol and his lifelong struggle with finding a better path. I knew “of Todd” from the time I was a teenager because he was in a band with his brother. From my vantage, he was the cool guy that went to all of the parties and had a great life because he was in a band. Hearing his perspective now, these many years later, makes me realize yet again that we all tend to glamorize certain lifestyle choices that often represent a very lonely, aching and painful existence for individuals whom we admire. We don’t often get to see the very real, “other” side of the journey, but today, Todd’s story will take you right into the heart of addiction to help you see the dark path where it leads. He’ll also leave you feeling motivated, hopeful and happy by sharing his ultimate triumph and how he was able to overcome. 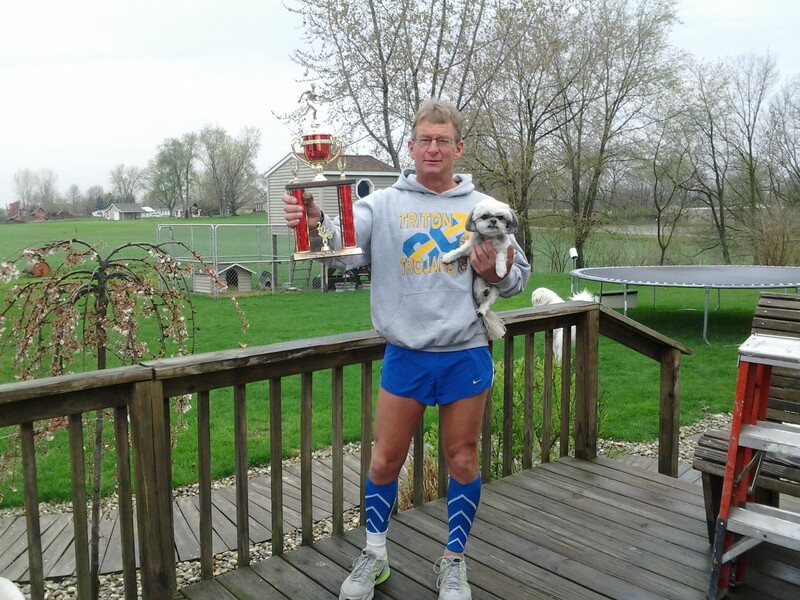 Please enjoy his post, and I hope to have him back again as he continues to grow the Randy Miner Memorial Country Run in Etna Green, Indiana. If you haven’t checked it out yet, please do so. It’s a helluva hot and sweaty challenge, but also tons of fun without a lot of hassle. Sign up online here for a 1 or 4 mile run. You can also follow Todd and the RMMCRun on Facebook. Enjoy the read! I grew up in a normal middle class home with loving parents in Etna Green, Indiana. I have two sisters and a brother, all older than me. I played sports but wasn’t great at any of them. I do that remember the older kids nicknamed me OJ because I was so hard to catch whenever we played football. Music was in my blood as a youngster. My brother was a guitarist who played in a band with other high school kids, and I would tag along to all his shows. During that time, I developed a passion for the drums. By the time I was thirteen years old I was playing every weekend in a popular, local rock band with my brother and two older guys. At first we played parties and high school proms, but before long we found the night club scene to be more productive. I soon found myself in a bar three to four nights a week, and it wasn’t long until I started sneaking drinks and experimenting with drugs. The bartenders thought it was neat to slip me what looked like a coke but was really much more, or when I got tired, they’d say, “Here take one of these.” Looking back, I realize it was a very bad environment for a teenager. During this time, I also started noticing this long-haired guy often running through town with brightly colored shorts and shoes. I knew who he was, but I found it strange that Randy Miner, the hippie, cigarette smoker from down the street was running. What was up with that? Randy started a running craze and more people began to hit the streets, including me and my friends. In no time, we were following him and his family to all the local road races on Saturday mornings. Randy and I really connected, and he took me under his wing and began to mentor me. He was like my coach, my big brother, and my best friend all rolled into one. Even though Randy was ten years older and had a family, he made time for me. That still blows my mind. I was too cool to play high school sports, and even if I had wanted to, my band schedule prevented me. Even so, by the time I was fifteen, running had become a huge part of my life, and I found myself leading two lives. In one, I was a health nut who worked out like a mad man, and in the other I partied like a fool. Randy saw the divide and worried that I was headed the wrong direction. Randy constantly encouraged me and instilled confidence in me. He even coaxed me into joining cross-country my senior year and I won almost every race I entered. It was something I never would have tried without the urging from my friend. I probably could have continued my running in college, but I chose to enter the work force instead. Why not? I was going to be a rock star anyway, I thought. Once I started working for a living, running became less important, and I partied more. Randy and I grew apart. I began to drink, smoke, and use every drug available on a daily basis. I had a love affair with cocaine, LSD, marijuana, and mostly alcohol. I drank constantly for the next thirty years. There wasn’t a day I didn’t drink unless I was hospitalized or locked up. Before I knew it, I was a full-blown alcoholic and drunk every day! In 2008 I herniated two discs in my back causing severe sciatica. My condition became so bad that I couldn’t walk without excruciating pain. In order to make my doctors appointments, my wife would haul me as I lay down in the bed of my truck. I couldn’t sit, stand, or walk. The only relief came from laying down on my back. I was taking all kinds of pain killers, and I lost my job of twenty years. I was an invalid. I began to drink all day, every day. The summer of 2009 I had three back surgeries in the span of 4 months, eventually having three vertebrae fused in my lower back. The surgeries finally provided the relief I longed for and my mobility somewhat returned. I was granted disability compensation after a two-year laps of income. The pressure was off; now it was time to enjoy my life. I continued to drink every day. I was able to ween myself from the pain killers but I notched up the drinking to another level. I would start at daylight and drink until dark, consuming over a case of beer a day. I would black out every day forgetting simple things like what I ate for supper or if I ate. Randy had moved to Warsaw and I hadn’t seen him in years. One day while I was in the BMV, I heard his familiar voice. We instantly began to reconnect and before long we were hanging out together. We realized we both attended the same church and started sitting together every Sunday. He saw how much I was drinking and always encouraged me to slow down. He had a subtle way of saying it. I could always sense he loved me and had my best interest in mind. He complimented me when I needed it and never put me down. My family and I were camping in the summer of 2012 when I got the call saying Randy had an allergic reaction to dye injected during a routine exam and had a massive stroke. He never came out of the hospital. I was devastated! I was honored and humbled to be asked to be a pallbearer at his funeral. I decided that out of respect for Randy I would try to attend the service sober. Being sober that day was one of the most difficult things I’ve done. I was shaking so badly my wife held my hands to hide it. The sweat poured off of me as I wept with overwhelming grief. He was so young and vibrant. I loved that guy, and I swore to myself that day I would never put myself through that again. It was time to change. It didn’t happen right away; it took several attempts. My health was failing. I had high blood pressure, was overweight, and my guts were wrenched. I was killing myself and I knew it. Finally on the morning of August 27th, 2012, I asked God to give me strength to make it one day without alcohol, and instead of grabbing my morning beer, I walked. I walked thirty minutes that first day and everyday after until the runner inside me couldn’t take it any longer, and against doctors advice I began to jog a little at a time. In a few weeks I was jogging three miles without stopping. My craving for alcohol was diminishing while my desire to run increased. All my health problems went away within a month. I am amazed at the resilience of the human body. I entered my first of many races and started competing at a high level, winning my age group and finishing top ten in most events. I even resurrected a race that Randy made popular in the 80’s and 90’s. It’s called the Randy Miner Memorial Country Run. I have been sober almost three years now and I am so grateful to have this second chance at life. I’m living proof that anyone can succeed in breaking free from the chains of addiction. But it can’t be done alone. The good Lord has rescued me from a pit of darkness and brought me into the light where I can see clearly the road ahead. It is He to whom I owe it all. By the way, I also gave up the security of social security to live a healthier longer life. I no longer receive benefits. Way to go Todd I loved reading your story and grew up watching you and Randy running the roads of our little town congrats and keep up the good work ! So proud of you and the way you encourage others to take the right path in life. Nice article… remember, there is no finish line, just keep moving forward!